We are dealing with a unique case of the existence of our ancestors, the Illyrians, in another corner of the world, with thousands of kilometers away, which could shed light on their history, but also can enrich our historiography. Because it was a hideaway for thousands of years, they have kept alive popular features, language and Arberesh-Pelasgian-Illyrian-Albanian customs. There is existence of Illyrians in the region Indochina in Qafiristan (today Nuristan), a place where Afghanistan, Pakistan, China and Tajikistan, are met, precisely in the area where some time ago was killed Bin Laden, originally discovered by American screenwriter James Hilton, who shot a documentary titled Lost Horizons. In May 1983, Ernesto Skura wrote on League newspaper of Antonio Bellushi an article entitled "The Illyrians in Afghanistan." The same thing did in his book "Arvanites" the great historian of Albanian descent, Aristides Kola, which describes the time of placement of the Illyrians in this distant place. History explored to date shows that they are descendants of 6000 Illyrian fighters fled their country after the assassination of king Kliti by Alexander the Great around 300 BC. They remained there, because of distance they could not return home, but settled in this region, where they were forced to marry local women. They language was called "burrashka", the language of men, while women speak another language. Now this language is called again "burrashka", but is mixed and not written. The characteristics of these residents are different from those of the Pakistanis, they live longer, are taller and have brown hair, they make and drink wine as none of these areas and the region where they live. Valley where they live nowadays is called "hundëza" (small nose) and really it closes with a spout between two mountains that surround it. Another site called is called "balta" (mud). The mounting in front is called Torabora (falling snow). Another mountain next to the valley is covered with glaciers, that slide over time. This mountain is called "rakaposhi" (falling downwards). Although the country is mountainous, it is very prolific in producing vegetables, fruits and various grains, such as: potatoes, peas, cucumbers, wheat, corn, barley, apricots, pears, apples, peaches, plums, figs, cherries , grapes, watermelon, etc., products that locals does not cultivate. The inhabitants are excellent farmers and have created a stunning and majestic system of rooftops and irrigation that connect and feed terraces with. People are very friendly and helpful to each other. President of Hundzës has the title Mir (the best). Their largest holiday is the solar New Year (as Pelasgians and Arberesh), called Naurosh (wish us) and falls on March 21. The Hunza are very different compared with the Pakistanis with dark skin or the Afghans and the Chinese. Hunza are white skinned with red cheeks. Most of the 50 thousand Hunza have blue, green or gray eyes, and hairs ranging from the yellow of maize to the black of raven. Some children also have red hair. 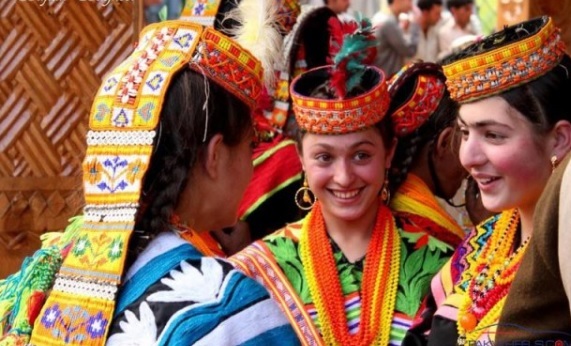 Up in the mountains is a great tribe called Kalash and their similarity with European ancestors leaves you dumbfound. Kalash gods headed by the god Di-Zau (Sun-Zeus). Kalash display on their gates a symbol which expresses their ancient origins of Illyrian and their connection to Alexander the Great, two-horned goat (the goat of Skanderbeg had two horns on the helmet). A wild flower in yellow that children gather it in the mountain or field is called "Bisha". Men wear white pants called "shalëvare" (hanged saddle), while women call their shirt kamish (worn in the flesh). Hundza dances are accompanied by drums, pipes or nozzles and the dancers jump to catch it around the circle. An important folk dance is the dance of the swords, which is always danced by men and the dancers wear colorful robes called "kamarbunde". Scholar Dr. J. M. Hoffman has twice visited Hunza and draw the following conclusions: The settlement of the Illyrians is where Afghanistan, Pakistan, China, Tajikistan are meet and is part of Pakistan. The valley where they live today is called spout (small nose). It closes with a spout area, surrounded by two mountains 6000-7500 meters above sea level. A swampy place there is called Clay, etc.